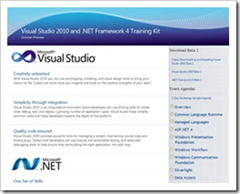 Last week, the Microsoft Visual Studio team released a new Visual Studio 2010 & .NET Framework 4 Training Kit that works with the Visual Studio 2010 Release Candidate. The training kit This includes 17 presentations, 22 Demos and 32 Hands-on Labs. I am also particularly excited to see content added for Visual Basic, as well as Office, SharePoint and Application Lifecycle Management!